You can pick them out of a crowd, walking around Lincoln Center, crammed onto the 1 or 9 trains among the everyday commuters. Hair pulled back sleekly, erect postures, small bodies, heads up from the neck. They're ballet dancers, swarming into New York City Ballet, American Ballet Theater, lugging duffel bags almost larger than they are. They've got that ballet look, from a lifetime spent at the barre, forcing their bodies to do the impossible. The opening scenes of "Polina," co-directed by collaborators Valerie Muller and world-renowned French choreographer Angelin Preljocaj, thrust you into the world where the majority of a dancer's life is spent: in class. It is a humorless world, nothing peripheral allowed, just the body straining against gravity. "Polina," based on the graphic novel by Bastien Vives, focuses on the nitty-gritty of life as a dancer: sweaty classrooms, pianist in the corner, bleeding feet, intimidating teachers, the sheer pressure of a pursuit so rigorous that "making it" barely exists. It's like qualifying for the Olympics. When "Polina" stays focused on dance, it soars. When it strays into the personal life of its lead, it moves almost compulsively into cliche. Since every single scene includes dance in some way (either in class, or out in the world), the ship stays upright the majority of the time. As a non-dancer but dance enthusiast, I was thrilled to these beautifully shot dance scenes, each unique in its own way. 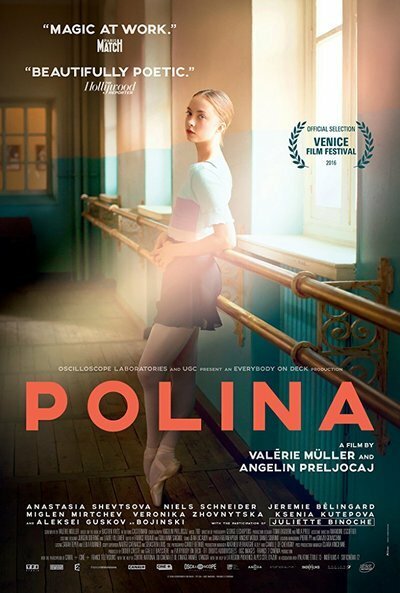 The diverse world of dance and the pursuit itself: that's what "Polina" is about. Anastasia Shevtsova (a dancer with the Saint Petersburg Mariinsky Theater) plays Polina as a teenager, accepted into the legendary Bolshoi Ballet, and dating a visiting French dancer, played by Niels Schneider. The two go to a modern dance recital, and Polina is rocked to the core by the passionate intimacy expressed between the dancers onstage. Impulsively, Polina follows her boyfriend to France to audition for a famous choreographer's company. Juliette Binoche plays the choreographer, Liria Elsaj, whose dance style is heavy, "grounded," filled with plunges into the floor, very different from the rising-up illusion of effortlessness required by ballet. Liria says to Polina, "My work is about longing." Binoche, in a casual sweat suit, is believable as a dancer, as well as a woman with a unique vision. Her gaze is assessing, sometimes merciless, a gaze from which Polina cannot hide. Much of the film is shot in intimate handheld style by cinematographer Georges Lechaptois. The dance classes are a flurry of arms, necks, legs, feet. But there are formal moments, where Lechaptois pulls back and lets us see the dance unfold in full, with no cuts. So many current dance movies are cut in a music video style, forgetting that part of the beauty of Fred Astaire and Ginger Rogers' dances (to give just one example) stemmed from the fact that they were filmed in full-body shots, the camera gliding with the duo. Lechaptois lets us see the dancer's bodies in full, with no trickery via editing. There are exhilarating moments when the camera is still: a closeup of Polina's feet in toe shoes, up on pointe, and down: the convex shapes her feet make. One of the most memorable scenes is an overhead shot of a tutu-ed ballerina dancing an entire sequence, her white costume stark against the black floor and black curtains. The film's narrative is a mosaic, a Girl in Search of a Dance Company. This journey takes her from Russia, to France, to Antwerp. At one point, she pairs up with Jeremie Belingard, a beautiful dancer with a kind humorous face. There's a breathless scene where they improvise a pas de deux along the river in Antwerp, their bodies black against the vivid winter sunset. Polina sees dance everywhere: girls in bars, a rapturous hug in a subway tunnel, the grasping body of a homeless man. Muller and Preljocaj allows us to see how a dancer thinks and sees: human bodies moving through space, and the displacement of air that creates. These are all wonderful scenes, although Polina—and her life—remain a cipher. It's not clear what is missing in her, although teachers and choreographers sense it. She throws a lot of tantrums. She doesn't have defining characteristics. Liria clocks Polina's self-involvement. These observations are dispersed, though, in the cliched narrative about an innocent girl lost in a big city, maybe falling in with the wrong crowd, drinking, smoking, etc. In the scenes outside the dance world, the film reverts to a simplistic YA novel or ABC after-school special. The most important thing "Polina" does—and it is testament, again, to the involvement of Preljocaj, a man who has devoted his life to dance—is that it shows that the everyday life of an artist is not made up of catharsis and accomplishment, triumphs and breakthroughs. Those moments only come after years of hard work, of failing and trying again. This is an element of art it is difficult for "civilians" to understand sometimes. There's an incredible sequence showing this in eloquent fragments: Polina waitressing, Polina in the dance studio, Polina flopping into bed, Polina shoveling food into her mouth, Polina waitressing, Polina dancing, Polina flopping into bed ... It's never-ending and it tells the whole story. Dance is not about the results. It is about the process. "Polina" is precious for that aspect alone.